28 • RV PRO • September 2018 rv-pro.com R V M A N U F A C T U R E R S "(Inside) we have a more open concept with 19 to 20 feet of space in the back that opens up to be a living room, bunk room or more room for toys," Hamood says. 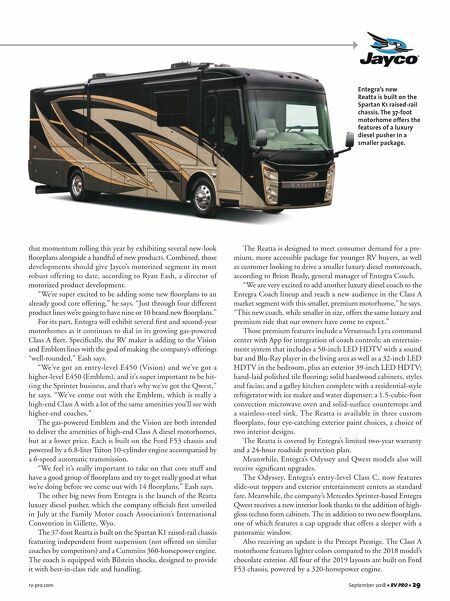 "In our Eagle line, this is really our first adaptation to the toy hauler segment to do a mid-bunk." At the center of the company's towable offering are the latest additions to its popular Jay Flight trailers. These new floorplans include a 34-foot mid-bunk (34MBDB) and a 32-foot rear sleeper with an outside kitchen, and the newest addition to the Jay Flight SLX 8 line (235RKS). 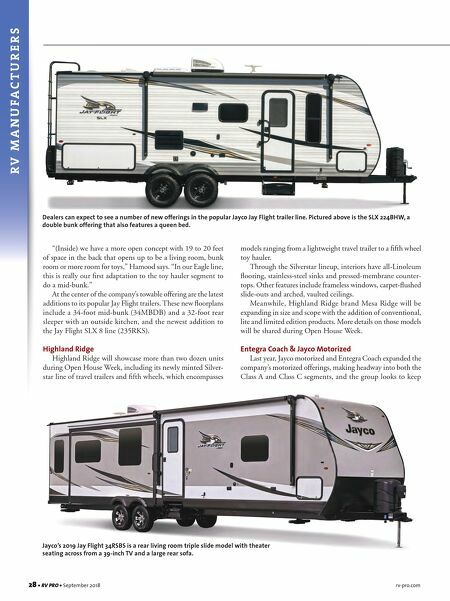 Highland Ridge Highland Ridge will showcase more than two dozen units during Open House Week, including its newly minted Silver- star line of travel trailers and fifth wheels, which encompasses models ranging from a lightweight travel trailer to a fifth wheel toy hauler. Through the Silverstar lineup, interiors have all-Linoleum flooring, stainless-steel sinks and pressed-membrane counter- tops. Other features include frameless windows, carpet-flushed slide-outs and arched, vaulted ceilings. Meanwhile, Highland Ridge brand Mesa Ridge will be expanding in size and scope with the addition of conventional, lite and limited edition products. More details on those models will be shared during Open House Week. Entegra Coach & Jayco Motorized Last year, Jayco motorized and Entegra Coach expanded the company's motorized offerings, making headway into both the Class A and Class C segments, and the group looks to keep Dealers can expect to see a number of new offerings in the popular Jayco Jay Flight trailer line. Pictured above is the SLX 224BHW, a double bunk offering that also features a queen bed. Jayco's 2019 Jay Flight 34RSBS is a rear living room triple slide model with theater seating across from a 39-inch TV and a large rear sofa.